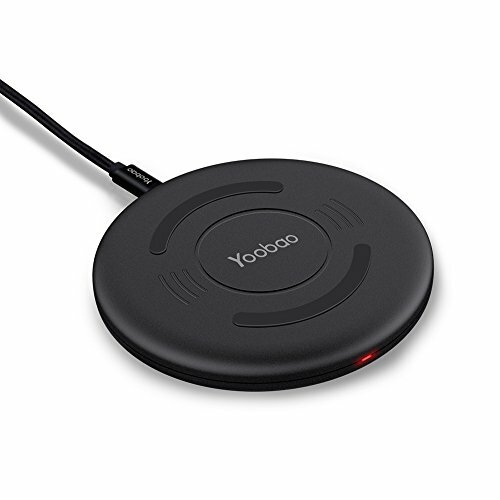 Yoobao Wireless Charging Pad works with any Qi-enabled devices or devices that equipped with a Qi-compatible receiver. Power Source: AC adapter with micro USB port plugs into wireless charging pad. Easy To Use - Connect the pad to power source, the indicator light will turn red, then drop your phone on top, the indicator will blink in blue, charging begins. It is very convenient for your charging. Ultra Thin Design - With only 9.8 mm thickness and 85 mm diameter,it is very handy and pocket-friendly for your digital life. Safety Protection System - Equipped with intelligent coils inside,the charging pad can prevent your phone from short-circuit,over-current,over-charging voltage etc.,to provide you a stable and safe charging. Working temperature: 0 ? to 45 ? Storage temperature: -20 ? to 60 ? Yoobao provides our customers with 12 months warranty and friendly, easy-to-reach services. Anti-Slip & Portable - Antislip rubber strip keeps any phone in place to ensure complete security while charging. Sleek and compact build takes up minimal space with 0.38in thickness. Ultimate Charging Convenience - Enjoy convenient wireless charging for iPhone 8, iPhone 8 Plus and iPhone X - just set it down on the pad and go. Experience a new wireless way to charge. Case Compatible - Charge through most cases - up to 0.15in. Safety Protection System - Equipped with intelligent coils inside, the charging pad can provide you with a stable and safe charging. (For the best Wireless Charger results, we would like you to use a 2A adapte (NOT INCLUDED)). What You Get - 1x wireless charging pad, 1x 4ft micro USB cable, 1x user manual, and the 18-Month Warranty. Contact us with any questions or concerns - We are here for you.